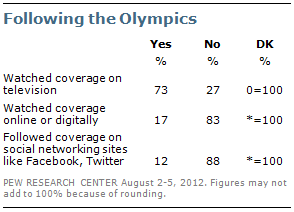 Large majorities of Americans are following coverage of the Olympic Games in London. 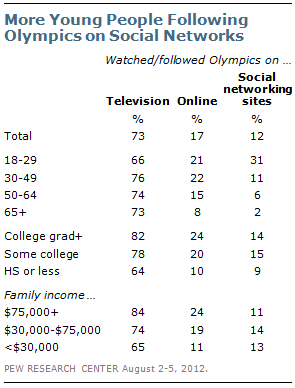 Nearly eight-in-ten (78%) say they have watched or followed Olympic coverage either on television, online or on social networks. Television remains far-and-away the leading platform for Olympic coverage; 73% say they have watched coverage on television. Still, 17% say they have watched online or digitally and 12% report they have followed Olympic coverage on social networking sites like Facebook or Twitter. Most Olympic followers (68%) say they are watching events in the evening after they have already occurred. At the same time, almost a quarter (23%) say they are watching live during the day. The latest national survey by the Pew Research Center for the People & the Press and the Pew Internet & American Life Project, conducted August 2-5, 2012 among 1,005 adults, finds that NBC’s coverage of the Olympics receives high marks from the public. Overall, 76% of Olympic watchers describe the coverage as excellent (29%) or good (47%); 18% describe it as only fair (13%) or poor (5%). Although there has been criticism of NBC’s coverage expressed online on social media sites like Twitter, the coverage is rated about equally well by those who are watching online and following on social networks (70% excellent/good) and those watching on television (77%). There is also little difference in the ratings given by those watching events live (85% excellent/good) and those watching in the evening after the events have occurred (75%). Young people under the age of 30 are much more likely to have followed Olympic coverage on social networking sites than are older Americans. About three-in-ten (31%) of those ages 18-29 have followed coverage on social networking sites like Facebook or Twitter, compared with 11% of those 30-49, 6% of those 50-64, and just 2% of those 65 and older. Following Olympic coverage online and on social networks appears to be a supplement rather than a replacement for television viewing. Among those following the Olympics online or on social networks, most (79%) say they are also watching Olympic coverage on television. The poll finds that those following coverage online or on social networks are no more likely to say they are watching events live than those watching Olympic coverage on television.